Val d'Isere Centre. Chalet Cherrier is the ideal choice for skiers looking for a chalet with excellent facilities and supremely easy access to both the skiing and the fantastic nightlife of Val d’Isere. The chalet is situated off the main street in the very centre of Val d’Isere with all the best après-ski spots a stone’s throw away. The popular ‘Le Petit Danois’ bar is located right opposite the chalet. The ski bus stop is only 40 metres (approx.) away and it is 300 metres (approx.) to the Solaise and Bellevarde lifts. There is hardly a better location in Val d’Isère. Please note: due to the fantastic central location of the Chalet Cherrier and nearby bars and restaurants, the property is not recommended for families. Chalet Cherrier is decorated to a high standard in a traditional Savoyard stone and wood style with modern furnishings. The chalet benefits from a large modern living/dining area, flat screen TV, all rooms with en suite facilities and the added luxury of a sauna. 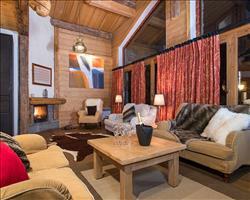 Early booking is recommended as this chalet is a very popular choice. We update Chalet Cherrier's details often, but facilities do change. e.g. some extras listed by the supplier as "free" or included might only be for the first time you use them, or for one time per party, then charged for further use. If any specific feature is essential to your holiday, make sure you ask us to confirm the details of it before you book your holiday. This all inclusive holiday to Chalet Cherrier in Val d'Isere, France departs Saturday 13th April 2019, for a 7 night stay on a "catered chalet" board basis. A local tourist tax (Taxe de Sejour or Kurtaxe) is levied by many councils in European ski resorts. It varies by standard and type of accommodation and is age dependent, so not everyone is charged. It's not included in the basic price of your holiday and is usually paid locally. For reference, the average charged in winter 15/16 was between 50p and £2 per person, per night. Val d'Isere lift pass price last reported as €294 (adult 6 day). Ask for a quote when booking Chalet Cherrier. The Farmhouse Val d'Isere France, Gatwick to Geneva 21st April. Bellevarde Lodge ... Val d'Isere France, Gatwick to Grenoble 21st April. 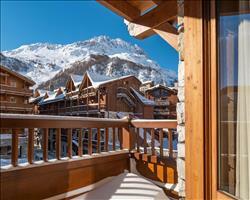 Bellevarde Lodge ... Val d'Isere France, Gatwick to Geneva 21st April. 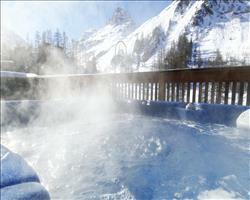 Aspen Hot Tub Sui... Val d'Isere France, Gatwick to Geneva 21st April. 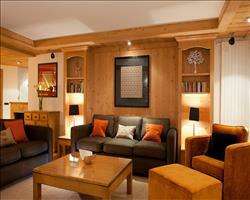 Grand Choucas Val d'Isere France, Gatwick to Geneva 21st April. The chalet was excellent and the staff were great. The location was perfect for us, I wouldn’t recommend it to families as it’s next to all the party stuff in Val, but this is why I chose it and we had an awesome week. The food was good – my only criticism is that it was a superior chalet and I was expecting something a bit more, but this wasn’t any reflection on the staff who did an amazing job! We had big sized rooms for a chalet and the showers were really good. We enjoyed the sauna too! It's the second trip to Chalet Cherrier in the last twelve months and we were very impressed again with the staff even though the team were completely different from last time. They were all excellent Nia, James, Harry and Sam, very helpful and ensured everyone in the chalet were happy....all week. The rep Laura was excellent too helpful and clear and she helped arrange snowboard lessons for us when we had little success....The only downside again was the access road to the chalet which gets treacherous with the ice and the very, small boot room. "One of the best located chalets in one of the best ski resorts in the world"
For anyone thinking of booking this chalet, we have stayed in it a couple of times over the last few years, and have always had a fantastic holiday. We have always booked the whole chalet (friends/family groups consisting of adults and children) and it is perfect for such a group as you can leave your personal belongings in the lovely lounge area for the week. The location is fantastic, right in the middle of the town centre and all the action, and is only a few minutes walk to the nursery slopes and all the main lifts to get you up into the mountains. It is also literally a stone's throw to the nearest bus stop which will take you (FOC) to lifts at La Daille or Le Fornet areas at either end of the town. 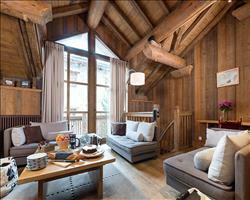 The only (slight) gripe I would have about this chalet is that the boot room is very small. Other than that, can't fault it and would highly recommend for a group of friends / families. "Great spot but not for light sleepers"
This place is great for anyone after big après ski and perfect for groups (our group loved it). There is a bar right opposite the chalet which is open until early hours and can get noisy so if you're a light sleeper or have young children who are, this may not be ideal. The rooms are spacious and have en-suites and wardrobe space so you can really move-in for the week like a home from home. Overall I'd say its great place to get a really exciting week out of your holiday in Val d'Isere, but choose somewhere out of town or in La Daille if you need perfect conditions to sleep well. "Not suitable for families with children"
This chalet is not suitable for families with children. Next to a nightclub keeping everyone awake until 3 am each night (closes at 2 am, but then very busy/noisy for another hour). "In the heart of VDI village"
Location and luxury can make a good holiday into a "great" holiday, and that is what you get from this fantastically placed chalet, right in the centre of the Val D’Isere village. A few minutes’ walk from the piste and literally across the road from the ever popular Le Petit Danois bar: party animals, you are welcome. If you do want to venture a little further out of town to the outlying hamlets and lifts (like La Daille or Le Fornet), the bus stop is forty metres from your door but, with all that wonderful VDI has to offer on your doorstep, its unlikely you'll have the time. Luxury is taken a step further with the inclusion of a sauna on the first floor- but make sure we check it’s availability on your dates "before" you book. With location, convenience and luxury like this, early booking is advised.